It's keenly important to design for many users rather than simply the novices and experts. Users want simplicity; they don’t have time to learn a profusion of features in enough depth to select the few that are optimal for their needs. To resolve this dilemma interaction designers use progressive disclosure. Progressive disclosure is a very powerful and effective technique that addresses this duality. When done well it helps technologies be more useful for a wider range of people. It’s a great way to shift the experience from people encountering a series of plateaus to a gradual continuum. That’s important as plateaus can restrict a user’s growth with a technology and create a novice vs. expert divide. Plateaus often appear in user interfaces in the form of ‘wizards’. These step-by-step, simplified choices (based on a richer underlying feature set) are great initially as they support the novice. But unfortunately they often imprison them too. When the user needs to deviate or do even a little more than what’s prescribed, they are required to work in the space intended for the expert. That can feel like stepping into the cockpit of a 747: an environment that relies on years of training to be able to successfully understand the myriad of switches and dials. It’s too much and it becomes cognitive overload for all but the most well-practiced. That expert knows where everything they need is: because they’ve practiced and put the hours of work in to learn it. The thing is, investing all those hours simply isn’t practical for most of us. It’s fine training experts, but if we want wider adoption and broader use, interfaces need to work for a lot more than just the chosen few. That’s where techniques like progressive disclosure can really help. They create continuums that support the learning and uncovering of the depth and breath of features in a way that suits the individual using the interface. It happens on their terms and can allow for varying degrees of knowledge with out the need to leap from novice to expert in a single bound. Are you designing your #UI with just experts and novices in mind? You may be missing out! 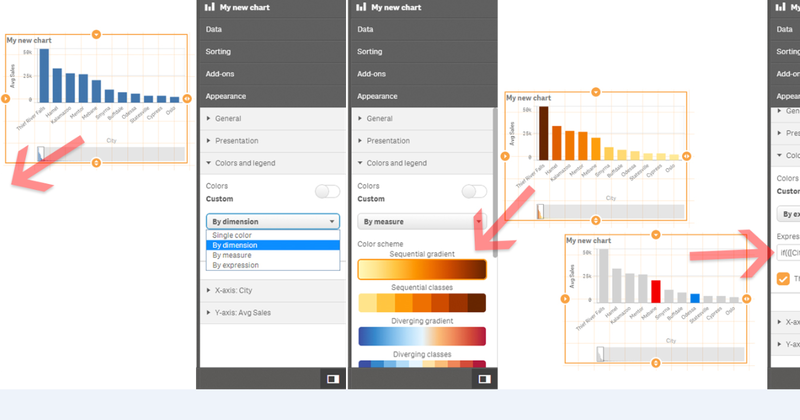 Displaying Visualizations - The responsive thinking in our charts uses progressive disclosure to help balance the amount of information shown. 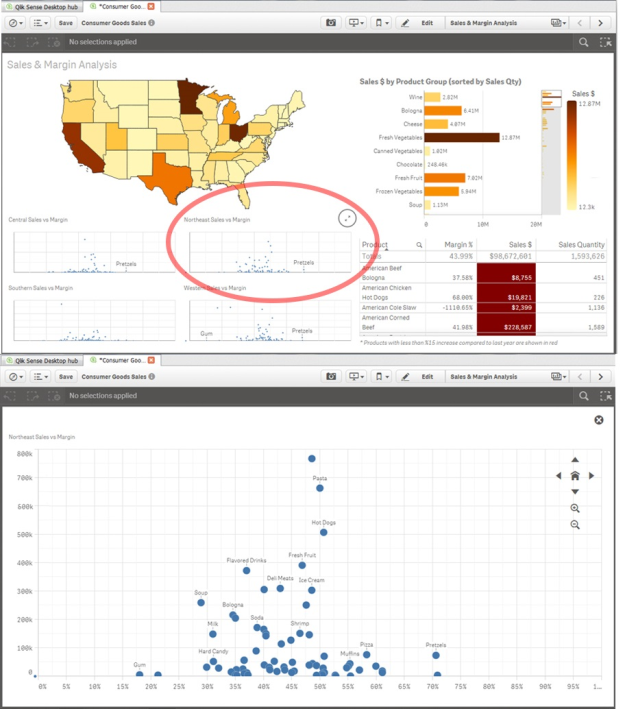 For instance, when the chart is small and part of a dashboard, the shape of the data is stressed and the supporting details removed. When expanded and given more space, we disclose the additional information and offer more features to help you work with the item that is now the focus of your attention. Creating Charts - Here we use it to help people build a chart, by giving feedback and showing the pieces falling into place as the user adds or changes elements. It’s instant reward and feedback. It helps the user decide when they’ve done enough, without being overwhelmed by all the features and possibilities. Adjusting Properties - This really is at the heart of the continuum idea. 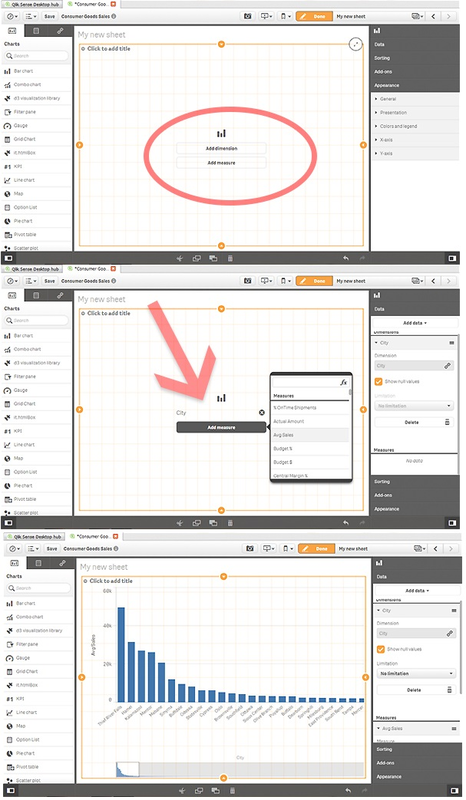 I can create a chart with drag and drop and it all works, thanks to automatically set smart properties. If I want I can then adjust a property and choose a different approach. If I’m more advanced I can adjust the nuance of that approach to perfectly match my vision. Those are just three examples of how we use progressive disclosure in product design. The ultimate goal is to always have just enough choices, paths and tools to hand at any given time, whether you are novice, expert or anywhere in between. Creating an experience that enables you to effortlessly get into a state of flow; and as if by magic, the perfect item always pops up. You don’t fumble around for what’s next and conversely if you’ve done enough you don’t have to do any more.